One of the few Russian words every English-speaker knows—vodka, gulag and sputnik are others — is ‘dacha’. It has no exact counterpart in English since the term ‘country cottage’, which is what a dacha ostensibly is, implies something very different. The distinction is important. British people who go to their weekend cottage in Norfolk or holiday home in the Lake District, generally think of themselves as visiting an alternative community which they usually want, to some extent, to participate in. Part of the attraction of the village is that there is a life going on which does not depend on the city for its existence. Of course, this is becoming less so nowadays as rural England is hollowed out and turned into more of a commuter resource. But neither there, nor in America, where wealthy New Yorkers migrate to the Hamptons on summer weekends, is the sense of going to an alternative community completely absent. Dacha settlements are a completely different concept. There is no pub, no church, no village hall, no collective sporting facilities, no farm at the centre of them, and no post office or local cricket team. There is no sense of community. Often there is not even a shop. A dacha is in a sort of dormitory suburb inhabited only on summer weekends, unless babushka and her grandchildren migrate out there for a couple of months during the hot weather. The dacha owner is no more likely to be on chatting terms with his neighbours than he is when he is at home in Moscow or Petersburg. He does not feel part of a differentiated community in the way that the inhabitants of Dulwich, say, or Gramercy Park. Through the eighteenth century people increasingly came to see an escape from the city as a practical necessity in the summer months when the level of disease was such that epidemics were frequent. But it was the arrival of the railways, which gave the middle-classes access to the country on weekends, that transformed dachas from individuated country residences into the kind of mass phenomenon that we know today. Developers built dacha communities near railway stations outside Moscow and Petersburg. Families moved there for the summer months, with father travelling in to his office either on daily or weekly basis, depending on distance. These communities were completely cut off from the rural life round about them. It was considered both dangerous and socially damaging to have anything to do with the locals who did not understand the respect for privacy that was behind institutions like the garden fence. Dachas survived the Revolution and a wonderful map is published (available at the map shop in Kuznetsky Most) showing Moscow in 1931, with all its dacha settlements clearly marked. The larger ones were at Losinoostovskaya, Skhodnya, Kuntsevo and Tsaritsyno. But there were many others. All were near railway halts so the inhabitants of a city without cars could go the country on weekends. The opening three pages of the book by Stalin’s daughter, Svetlana Alliluyeva, Twenty Letters to a Friend, is a hymn to the dacha in its heyday in the 1950s and 60s. 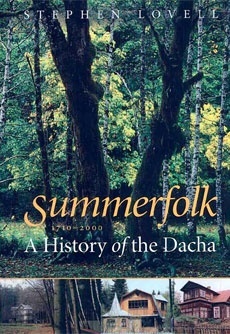 It is a beautiful evocation of a time when people were still free to hike in the richscented summer forests, from Barvikha to Romashkovo, and on to Odintsovo, without the fences, security guards and general ‘privatisation’ which has ruined the experience since then. She writes poignantly of the tired but contented family travelling back into the city on a sunlit Sunday evening with ‘a faded bouquet of wild flowers on the rack of the elektrichka.’ You have to be completely immune to the charms of Russia not to be moved by her vision of these simple pleasures, now alas long gone. Stephen Lovell has written the only book in English which will help you understand this tradition, and also why it is now dying. Today a dacha is likely to be as much a status symbol as any other form of property. Few ordinary people can afford to buy one within a reasonable distance of Moscow. The ironic result is that such people have started buying derelict houses in villages, just their English and American counterparts have been doing from the time of Wordsworth and Thoreau. As rural England becomes a more purely recreational environment, it begins to resemble the original dacha idea. Russians move to villages which still at least have shops and a church, while we get deserted villages in which the Post Office has closed and the farm become a riding centre. So the world turns.